This spicy lemon poha recipe is a easy breakfast recipe. 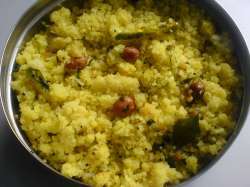 It is a variation of a traditional poha recipe from Karnataka. Poha is also known as beaten rice, flattened rice. In Indian languages, poha is known as avalakki(Kannada), aval(Tamil), chivra etc. This poha recipe is made for breakfast or as a evening snack. It is filling, easy to make and you can make some preparation in advance. It keeps well in the fridge for 2-3 days. Just heat it before serving. Most Indian houses have the required ingredients in their kitchen. So it is easy to make at any time. You need thick or medium thick poha for this recipe. 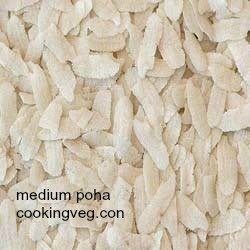 We need to grind the poha to fine powder. You may grind the poha in advance and keep it for a few days. Lime juice - 1 tbsp, more or less according to taste. Green chilies - 3 - 4 or more according to taste. You may also use green chili paste instead of chopped chilies. Salt 1 teaspoon or to taste. Sugar - 1 tsp, more or less according to taste. Take poha on a plate and remove any impurities, such as stones, sticks etc. Add poha to a mixer jar and grind to a find powder. Add ground poha powder to a bowl. Add salt, sugar and lemon juice. If adding ginger and chili paste, add it now. Add a little water and mix well. Poha will immediately absorb all the water and start to lump up. Take care to break the lumps and mix well. Sprinkle more water as needed. For our 1 1/2 cup of poha, we will need about 3/4 to 1 cup of water. Do not add too much water now. Keep aside for 10 minutes. (you may keep this mixture in the fridge now and use within next 2-3 days. In a deep wide pan(kadai/wok) , heat oil. Add mustard seeds, cumin seeds. When they crackle, add cut green chilies (if using), curry leaves and chopped ginger (if using). Fry for a few seconds. Add the powdered and soaked poha mixture. Mix well. Cover and cook on low flame. Keep covered for 2 minutes. Remove cover and mix again. It should be steaming now. Cover and cook for another minute. Add grated coconut and fresh coriander leaves now or use it as a garnish while serving. Switch off and serve hot. You may add some finely chopped vegetables such as cauliflower, potatoes, capsicum, tomatoes etc. if you wish. Add these vegetables to the oil and cook a little before adding poha. Or you may boil the vegetables till just done. Pour on a colander to remove excess water and add the vegetables when you add poha. Enjoy this spicy lemon poha recipe.